"My husband thought this was the best invention ever. I like how easy it is." 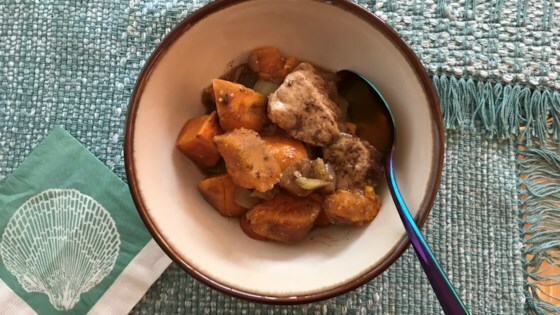 Stir the apple, sweet potatoes, onion, nutmeg, cinnamon, ginger, salt, and pepper together in a bowl. Pour into a baking dish and place the chicken breasts on top. Bake in the preheated oven until the chicken is no longer pink at the bone and the juices run clear, 45 to 60 minutes. An instant-read thermometer inserted near the bone should read 165 degrees F (74 degrees C). This was really good and so easy. I used butternut squash because that's what I had on hand. I will be making this again. I made this in the slow cooker with boneless chicken breasts. Overall, it was pretty good, but I found the ginger overpowered the other spices. I might use pumpkin pie spice next time.